The President of the People's Democratic Republic of Laos is the head of state of the People's Democratic Republic of Laos. 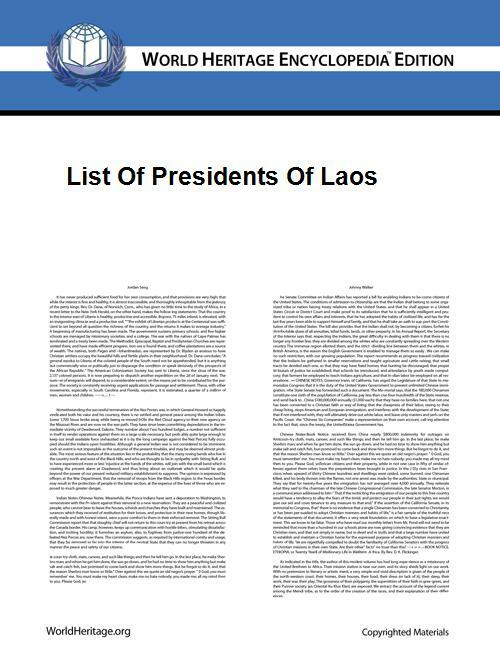 The president represents Laos internally and externally, supervises the work as well as preserving the stability of the national governmental system and safeguards the independence and territorial integrity of the country. The President appoints prime minister, vice presidents, ministers and other officials with the consent of the National Assembly. The head of state is the commander-in-chief of the Lao People's Army. Since Laos is a one-party state, with the Lao People's Revolutionary Party being the sole party allowed by the constitution, all the presidents of the People's Democratic Republic have been members of the party while holding office. The current president is Choummaly Sayasone, since 8 June 2006. He is also the General Secretary of the Lao People's Revolutionary Party, and he is ranked first in the Politburo hierarchy. The office of the President of the People's Democratic Republic traces its lineage back to Prince Souphanouvong, the first President of the People's Democratic Republic, a member of the deposed royal family, who became President when the former Kingdom of Laos was overthrow by the Pathet Lao in 1975, at the end of the Laotian Civil War. Commons has media related to Presidents of Laos.